Blackberry Curve is the very popular handset from RIM house and this smartphone facilitates the user to be connected with different ways such as through Wi-Fi, Bluetooth , GSM etc .However ,the best way is to take help from Conference calling option that enables you to arrange a full of fun meeting with your dearest friends. 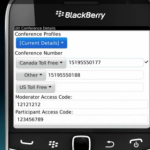 BlackBerry Curve smartphone is not only feasible for personal conference call but also for corporate calls. Whether you set up a conference call for personal or business purpose you have to follow some simple steps.